A small ship Alaska cruise allows you an even closer look at the beautiful scenery and exotic wildlife than most large or mid-sized Alaska cruises. 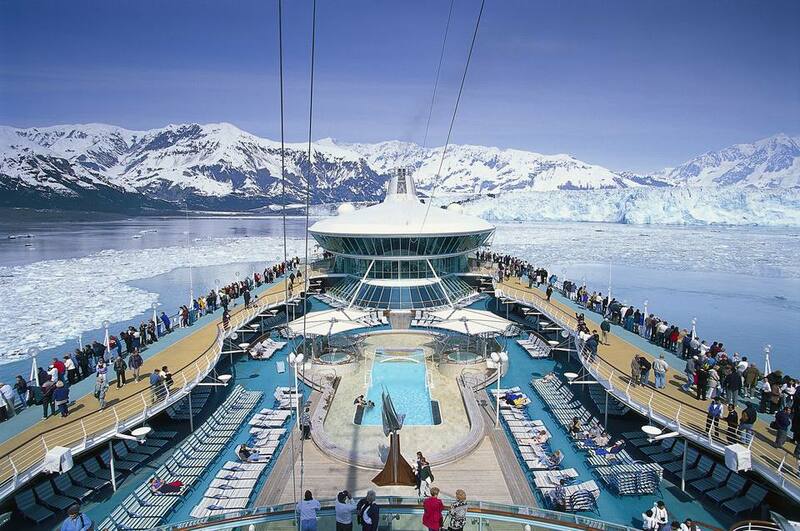 Several cruise lines with ships that carry from a dozen up to 500 passengers sail Alaska cruises. It doesn't take a rocket scientist to see the advantages of fewer cruisers exploring Alaska, enjoying excursions, or even just going ashore in the small Alaska towns like Juneau, Ketchikan, and Skagway. Two or three thousand visitors from one ship really make a difference in a small town! The smaller ships can also visit some places that the larger ones can only dream about like the Misty Fjords National Monument near Ketchikan, Tracy Arm Fjord, or the Dawes Glacier. If you are looking for a more exotic, out-of-the-way itinerary, a small ship Alaska cruise might be the best choice. One word of caution. These smaller ships are usually more expensive and often fill up fast. For this extra cost, you'll probably get smaller cabins and less entertainment on board, but the trade-off of a closer look at Alaska is worth it to many travelers. In addition, small ships have many activities (e.g. kayaking, hiking, paddle boarding) and/or shore excursions included, so the total fare may not be any more than on a large ship if you plan to take many wildlife or glacier-viewing shore excursions. In addition to those detailed below, there are also many other small yachts available for a charter that cruises Alaskan waters. The accommodations on these charter boats range from bare-bones rustic to luxurious. Small ship company Alaskan Dream features four different Alaska cruise itineraries, departing from Ketchikan, Juneau, or Sitka. The itineraries run from 8 to 11-days on one of five different small ships. American Cruise Lines operates the 92-passenger American Spirit on eight-day roundtrip cruises from Juneau. These cruises visit Glacier Bay, Kake, Haines, Skagway, Petersburg, Tracy Arm, and South Sawyer Glacier. At the beginning and end of the season, the American Spirit sails between Seattle and Juneau on 15-night cruises. Fantasy Cruises operates the 32-passenger Island Spirit on Inside Passage cruises of the Alexander Archipelago. These nine-day cruises are all-inclusive and primarily sail from Sitka, St. Petersburg, or Juneau. The ship also has repositioning cruises at the beginning and end of the Alaska cruise season between Seattle and Juneau. Lindblad Expeditions partners with National Geographic to have three ships in Alaska. The 62-passenger National Geographic Sea Lion sails 8-day cruises of Alaska's Inside Passage between Juneau and Sitka in May and June. Her sister ship, the 62-passenger National Geographic Sea Bird sails three itineraries that range in length from 6 to 15 days. The National Geographic Quest is larger and carries 100 passengers. This ship primarily sails 8-day adventures of Alaska's coastal wilderness between May and September. Le Boreal of Ponant Yacht Cruises has one cruise in Alaska that sails from Nome to Seward or Nome to Vancouver. Luxury cruise line Seabourn Cruises sends the Seabourn Sojourn to Alaska. The 450-guest ship is the largest in the "small" ship cruises visiting Alaska. The Seabourn Sojourn sails 11- and 14-day cruises between Seward and Vancouver that can be combined into a grand long voyage of 25 days since not all the ports repeat. Most small ships do not offer private verandas or luxurious accommodations. However, if you are looking for ultimate luxury on board, the Silversea Cruises' Silversea Silver Shadow sails 7-day Alaska voyages between Vancouver and Seward. With 382 passengers, she is much larger than most of the other ships in this category, but the Silver Shadow provides more amenities and is still considered "small". Silversea's expedition ship the Silver Explorer also visits Alaska, sailing roundtrip from Nome on a 19-day voyage or between Seward and Vancouver. The Boat Company operates two small ships sailing Southeast Alaska. This company has been in operation since 1979 and currently sails 7-day cruises between Sitka and Juneau. Sail on the luxurious yet comfortable 24-passenger M/V Mist Cove on an amazing soft adventure eco-cruise that has marvelous daily opportunities for exploring, hiking, kayaking, and fishing from Alaska streams or bays on its 20-foot skiffs. Unlike other cruise lines, The Boat Company ships have a fishing license, so anyone who loves fishing for halibut or salmon especially appreciate a journey on one of these two ships. In addition, the company is owned by a non-profit educational organization dedicated to SE Alaska conservation. This non-profit status means that some of your cruise ​fare is tax-deductible. Un-Cruise Adventures has six ships sailing in Alaska - the 36-guest Safari Explorer, 22-guest Safari Quest, and 84-guest Safari Endeavor are marketed as the company's "luxury" adventure ships and the fare includes bar drinks like spirits, wine, and beer; shore excursions, onboard activities, and port fees. The 76-passenger Wilderness Discoverer, the 60-passenger Wilderness Adventurer, and the 74-passenger Wilderness Explorer are marketed as the "active adventure" ships. The shore excursions and activities are included with their basic fare, but the bar drinks and port fees are extra. Eleven different 7-, 14-, or 21-day soft adventure expedition itineraries explore Southeast Alaska between Juneau and Ketchikan, or Juneau and Sitka, or roundtrip from Juneau. Repositioning voyages of 11- or 12-nights sail the Inside Passage between Juneau and Seattle in April, May, August, and September. All the Un-Cruise Adventures' itineraries feature plenty of opportunities for hiking, kayaking, and other activities. We loved our Wilderness Discoverer active adventure cruise between Ketchikan and Juneau and the many off-the-beaten paths we explored, as well as the great wildlife viewing and adventure activities.